There’s a little girl here who’d LOVE this activity! Oh, this is so neat! My kids will have a blast doing this! Hey! Thanks for joining us over at One Sharendipity Place!! As an ex-kindergarten teacher I love sites like this with all your creativity, and I’m so glad you found us!! Please come back and link up often! So fun! Thank you for sharing at our Pinteresting Party! My mom made one of these for my 4 year old and she LOVES IT!!! Visiting from Serenity Saturday! My grands would love this! Thanks so much for sharing it with SYC. 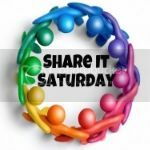 Thanks for linking up to Share It Saturday! I’ll be featuring your post tomorrow!